The restaurant and foodservice industry in Virginia is expected to bring in over $16.3 billion dollars in sales revenue this year. The industry employs over 11% of the workforce, with an increase of 44,400 jobs expected by 2026. As those jobs become available, restaurant and foodservice owners will seek out employees who are highly trained and educated. Earning a culinary degree or diploma is step in the right direction to make sure you stand out and get noticed. 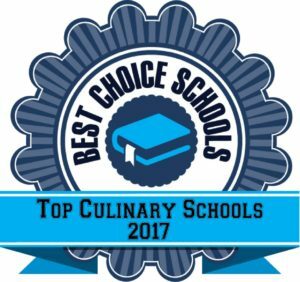 We created a list of the top 10 best culinary schools in Virginia. Schools included in our list feature a hands-on learning environment which includes state-of-the-art kitchen labs. We also looked for schools with a diverse curriculum and those that offer a variety of degrees and certificates. Many of the schools in our list are accredited by the American Culinary Federation. All schools have a positive reputation in the industry based on our research. The University of Richmond is home to the Center for Culinary Arts, a top culinary school offering four different certificate programs. Students can select from a certificate in Culinary Arts, Baking and Pastry Arts, Nutrition and Food Science, or Food Service Management. There are no prerequisite courses needed to begin any of these programs, allowing students to jump right in and begin their culinary education. Students learn in a state-of-the-art kitchen, allowing students to learn on the same equipment they will encounter out in the field. Courses are as diverse as the certificates offered and include a course in Brioche and Pate a Choux for Baking and Pastry Arts students, Diabetic Friendly Cooking for Culinary Arts students, Food Service Law and Bookkeeping for Food Service Management students, and the Healing Properties of Herbs for Nutrition and Food Science students. The AAS in Culinary Arts program at Piedmont Virginia Community College is a 67 credit hour program featuring an internship. Students have the opportunity to learn both professional and culinary skills through this top culinary program. Courses cover areas such as garde manger, food purchasing, cost control, and food preparation. Graduates are prepared to work as bakers, caterers, chefs, or cooks in a variety of venues including restaurants, hotels, night clubs, and cruise ships. Virginia College is a top culinary school offering both a Culinary Arts Diploma and a Pastry Arts Diploma program. The Culinary Arts Diploma program can be completed in 37 weeks and features a hands-on learning environment to allow students to gain experience in a professional setting. Students are immersed in the kitchen from the start of the program and receive individualized attention due to small class size. An externship opportunity is required as part of the program to prepare students for the workforce. The Pastry Arts Diploma program can also be completed in 36 weeks. Students have access to baking labs where they will perfect their pastry techniques and learn a variety of skills such as the art of plated desserts and wedding cakes. The Al Pollard Culinary Arts Program at Virginia Western Community College offers an AAS Degree and two Career Studies Certificates in either Culinary Arts or Baking and Pastry. The Certificate program is a 27 credit hour program providing a solid foundation in the field of food production, culinary arts, and hospitality. The AAS program can be completed in two years and prepares students to become bakers, pantry cooks, pastry cooks, sous chefs, and vegetable cooks. Students have access to the Claude Moore Culinary Kitchen, a state-of-the-art kitchen lab where students are able to learn their trade in a hands-on environment. Tidewater Community College offers an AAS in Culinary Arts accredited by the American Culinary Federation. Students learn both the business and art of preparing and serving a variety of different foods. Students complete a 240 clock hour internship opportunity in a commercial kitchen, working alongside professional chefs. Tidewater has a commercial kitchen lab so students have the opportunity to learn their trade with the latest in kitchen technology. Students can complete the program in just four semesters, making this program an affordable choice for students who need to save money. The AAS Degree program in Culinary Arts from Reynolds Community College features expert faculty and is accredited by the American Culinary Federation. Students can choose to complete the program on a two year schedule or on a fast track schedule, provided they meet the qualifications to do so. Students have the opportunity to learn their trade in a state-of-the-art kitchen environment with the latest in modern kitchen equipment. Students who already possess a degree or certificate in culinary arts can apply for the Pastry Arts Career Studies Certificate. This Certificate program is a three semester program for those with experience who want to focus on baking, pastry production, and confections. Dabney S. Lancaster Community College offers both an AAS Degree in Culinary Arts and a Certificate in Culinary Arts. Students learn from experienced faculty in a state-of-the-art teaching kitchen. General education courses are delivered using a variety of methods including lecture, web based, independent study, and video. Students learn a variety of skills such as menu planning, budgeting, safety, sanitation, and food preparation. Coursework covers topics such as garde manger, soup, stock and sauce preparation, American Regional cuisine, and International Cuisine. An internship experience is included as part of the AAS Degree program. The Art Institute of Virginia Beach is a top culinary school featuring exciting internship opportunities, a state-of-the-art learning environment, and industry-experienced professional instructors. Students have the opportunity to learn outside the confines of a classroom or lab, they are preparing dishes on network television, competing in international food competitions, and training internationally to become the best in the business. The Art Institute offers a variety of degree and diploma programs to allow students multiple entry points onto the career ladder. Students have the opportunity to study world cuisines, allowing them to diversify their talents and make them more marketable in the industry. Stratford University is accredited by the American Culinary Federation and provides students with a global perspective on the culinary arts. Students can complete courses during the day, evening, or on the weekends to accommodate busy schedules. The state-of-the-art kitchen facility allows for individualized instruction when needed and fosters an environment for collaborative learning. The curriculum for both degree and diploma programs teaches students how to problem solve, manage a budget, control cost, and prepare a variety of food dishes. With five different program start times throughout the year and classes that can be completed in just five or 10 weeks, students can be out in the workforce in less time than many other schools. The Culinary Institute of Virginia is a top accredited culinary school with a variety of programs in both Baking and Pastry Arts and Culinary Arts. Students can earn their diploma in just 40 weeks and their AAS degree in 15 months. Baking and Pastry students learn advanced techniques such as multi-layer cake design, and sugar, chocolate, and pastillage showpieces. Culinary students learn about meat selection, International Cuisine, a la carte, and culinary nutrition. Externship opportunities are required as part of both programs, allowing students to gain professional experience before they enter the workforce.